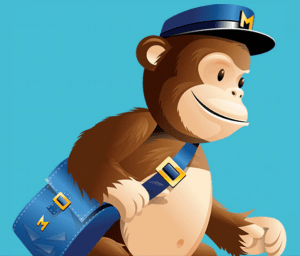 Curious to learn more about MailChimp’s project, I reached out to Mark DiCristina, MailChimp Marketing Manager and the annual report’s project leader, for a quick interview. Below he gives Optimum7 details on the inspiration of the project and the success it has met thus far. “The idea of doing the annual report definitely wasn’t something we came up with our own. We’d seen both Warby Parker and Kickstarter do similar things the year before, and other web companies do them, too. We just thought it would be a fun exercise to do for ourselves. Essentially, we broke the project into three parts: data, presentation, and interaction, and we assigned people to run the different pieces. We started with talking about what kinds of things we wanted to include, then came up with concepts for how we thought it could work, then brought the winning concept to code and really ironed out the details there. Why Is It Successful In Our Eyes? 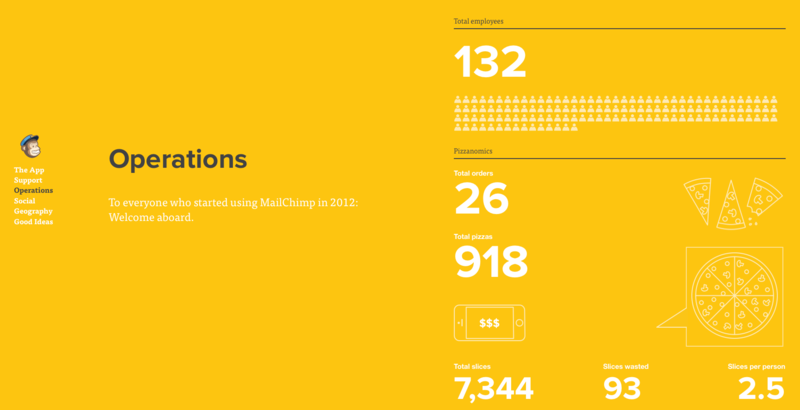 There are several aspects that work together to make the MailChimp 2012 Annual Report successful. After reviewing the report, I have pinpointed 5 main characteristics that make it effective. The 2012 report is not only consistent with itself, but it is 100% consistent with MailChimp’s branding standards. While this may seem like a given, many companies trade consistency for bells and whistles. 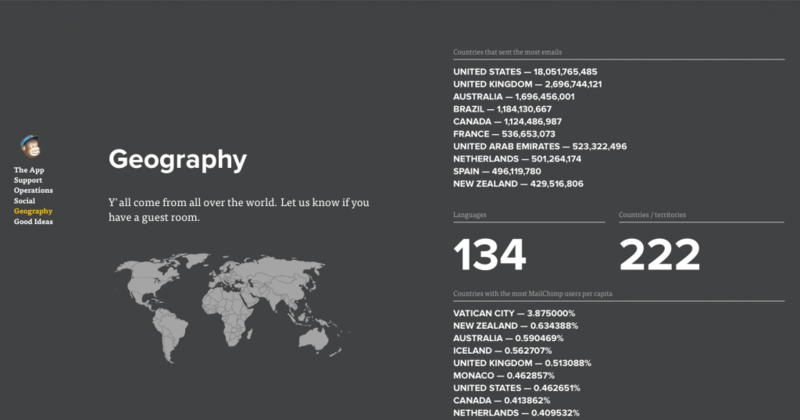 The type choices, color scheme, and even the tone of voice are distinctly “MailChimp”. This may seem frivolous to some of you, but details like this are what enables a consumer to connect with a brand. Don’t believe me? Then why does MailChimp have over 85,000 followers on Twitter? Why does Nike have over 11 million likes on Facebook? Why does Starbucks have over 886,000 people in their circles on Google+? MailChimp, Nike and Starbucks are not people! They are brands- brands that we have become so attached to that we have mentally assigned them personalities and human characteristics. This is all possible because of consistent, reinforced branding. When I first visited the report, I was intrigued, and quickly scoured the Internet for a couple of hours trying to find similar examples of interactive annual reports. The search wasn’t exactly fruitful. I found a few examples of well-designed annual reports online, but most were either afterthought microsites, or landing pages with a PDF. Very few even came close to what MailChimp has done here. According to Robert Coalmine, a Professor of Psychology at Arizona State University, their are six categories into which persuasion techniques commonly fall: reciprocity, consistency, social proof, liking, authority and scarcity. Think about the last time you were trying to befriend someone. Whether the intentions were professional, platonic, or romantic, chances are you cracked a few jokes to break the ice a bit. Humor and likeability go hand in hand. On the MailChimp report, the use of humor can be found in the images, text, and statistics. See below for examples. Would you have thought to put a picture of a chimp’s behind on the cover of your annual report? Probably not. But it works here, doesn’t it? “Y’all come from all over the world. Let us know if you have a guest room.” This is another example of the brand gaining a personality. Including the “Pizzanomics” of MailChimp is a light-hearted statistic that reinforces the company’s playful, creative culture. Like any successful design project, the first and most important step is to understand the purpose. This project isn’t meant to be a traditional annual report, dense with statistics and facts that the average person (present company included) would neither understand nor have any interest in. The purpose here was to create an informative, easy to read report that falls in line with MailChimp’s fun, creative branding and company culture. After researching MailChimp’s CEO Ben Chestnut and his open-mindedness to creativity, it is no surprise that the unrestrained minds at MailChimp are able to produce truly excellent content. If these designers and developers had their imaginations restricted, we may have been given a boring, page-flipping PDF that so many other companies produced this year. Instead, we were given this one-page report that we couldn’t stop scrolling through. One of the greatest challenges I face as a designer is not what to add to a site, or a brochure, or a business card. It is what to leave out. MailChimp’s minimalistic branding already allows the design of this report to shine, but subtle animations, hover effects, and color changes between pages encourage interaction from users without overwhelming them. Is An Online Annual Report Right For My Business? Quite honestly, it depends. Every company is different, and so are its users. Some of your clients may like to hold a hard copy of the report, while others will never even open the one that comes in the mail. You have to consider your report’s purpose, and its target audience before making the move to online annual reports. If you do decide to put your report 100% online, there are a few things you should consider. Firstly, the online report may save you printing costs, and help the environment, but it may not always be the most budget-friendly option. To create a successful product, it is helpful to have a dedicated and experienced team of print, web and usability professionals. Those are not cheap. You will also need to consider how you will distribute this report. Since it is not as simple as adding and address and a stamp to an envelope and getting on with your day, you will likely need to hire a professional (or a team of professionals) to design strategies for circulating the report. This, again, is an expense. Ultimately, you must make the decision that makes the most sense for your business. If you have the resources to create something truly great on the web, go for it! But if you want to slap something together just to attempt to keep up with the Joneses, I’d suggest something in print. And if you do decide on print, don’t get discouraged. Print design can be extraordinarily beautiful. The bottom line is, you should create a product that you’d want to read cover to cover (or top to bottom) and that you can’t wait to share with your friends. Whether that be in print or on the web, is entirely up to you. 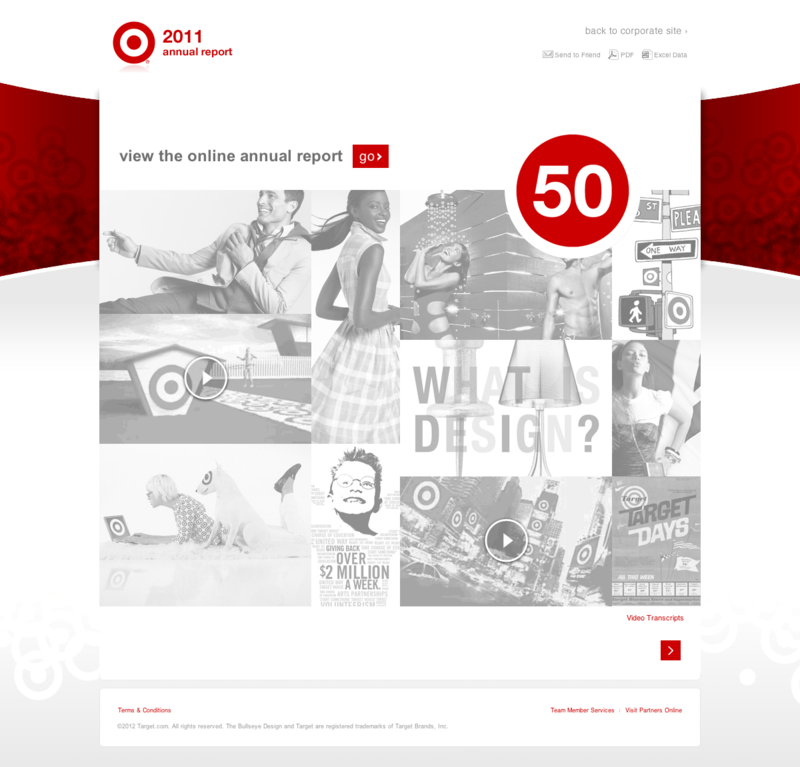 As I mentioned earlier, it wasn’t easy to find interactive annual reports up to par with MailChimp’s design. However, below is a short list of similar reports definitely worth a look. 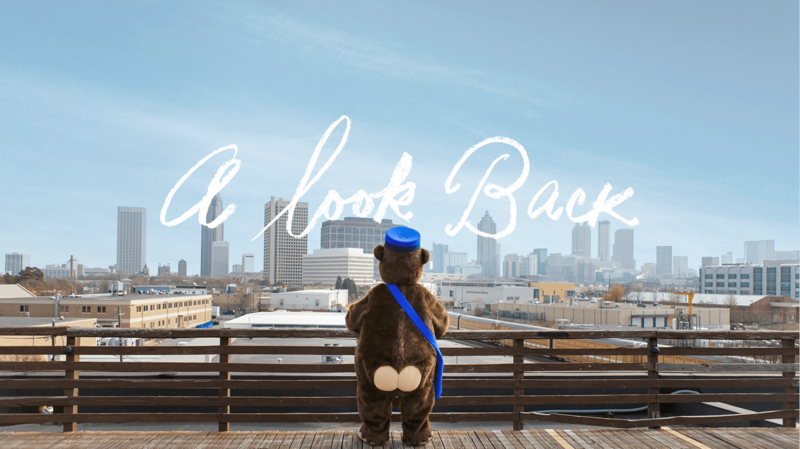 Using their well-known attention to detail, MailChimp has set a new precedent in online annual report design excellence. Now that most other design teams have gotten a glimpse of this creative approach, I am anxious to see what the 2013 reports will bring. 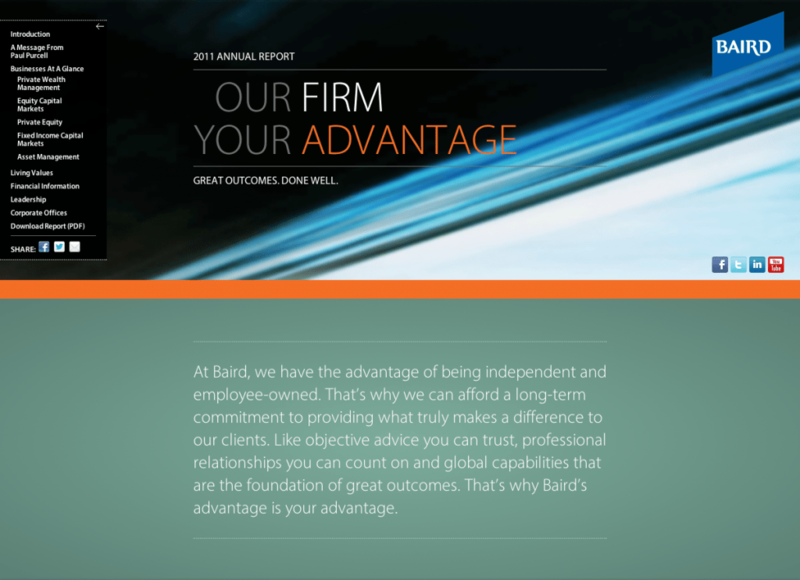 Does your company have an awesome annual report that I didn’t mention in this article? Be sure to let me know in the comments section or send me a tweet at @bridgetbfarrell.